A recombinant fragment corresponding to a region within amino acids 281-532 of Human AF9 (Uniprot ID P42568). THP1 whole cell lysate. HeLa cells. D54 xenograft tissue. Store as a concentrated solution. Our Abpromise guarantee covers the use of ab154492 in the following tested applications. WB 1/500 - 1/3000. Predicted molecular weight: 63 kDa. Note=A chromosomal aberration involving MLLT3 is associated with acute leukemias. Translocation t(9;11)(p22;q23) with MLL/HRX. The result is a rogue activator protein. Immunofluorescence analysis of paraformaldehyde-fixed HeLa cells, labeling AF9 using ab154492 at 1/500 dilution. Right panel costained with Hoechst 33342. 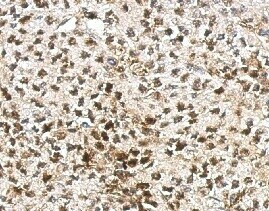 Immunohistochemical analysis of paraffin-embedded D54 xenograft , labeling AF9 using ab154492 at 1/750 dilution. Publishing research using ab154492? Please let us know so that we can cite the reference in this datasheet.